BetOnline date back to 1991 and were one of the first US internet bookmakers. BetOnline welcome United States sports bettors from ALL 50 states, which is rare. BetOnline are known for their excellent customer service and fast payouts. 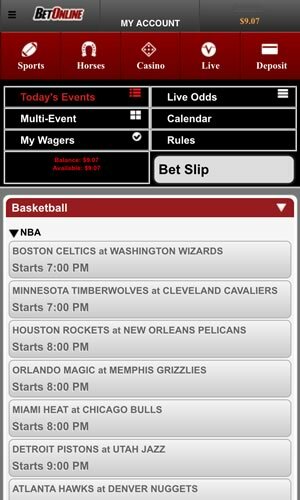 Place mobile wagers on football, baseball, tennis, hockey, MMA/UFC, golf etc. Make withdrawals to your credit card once you have made a min. of 5 deposits. BetOnline now accepts bitcoin. Bank from the US with zero restrictions. The US-friendly Betonline is one of the most progressive bookmakers out there when it comes to taking advantage of new technologies. It is no surprise that their website is fully optimized for mobile use on iOS, Android, Blackberry, and even Windows Phone. 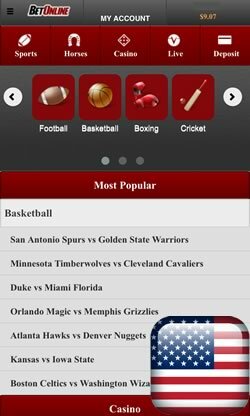 The US mobile sportsbook offers all of the key features required for a full betting experience. Furthermore, the navigation is really smooth and straightforward. They might not have the best design out there, but the functionality is top notch. Betonline made sure to bring all the important features from their web service to the mobile app for the ultimate betting experience. 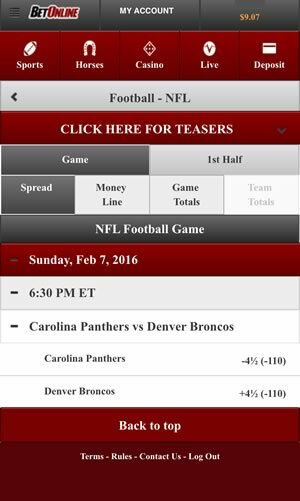 The BetOnline mobile site has a separate section for Live betting. There you will find everything that is also offered on the web service. This includes every horse race in the USA and Betonline is the only operator who covers that on mobile. Live betting is available on the NFL, NBA, English and European soccer, college basketball, NHL hockey, tennis, golf and just about every sport imaginable. Betonline provides fully functional Cashier on its mobile version. This means you can both deposit and withdraw your money via the app. Over the years BetOnline have earned a reputation for honesty and fairness. They are also known for having high credit card acceptance rates and exceptional customer support. ​You will find odds and betting lines on every major US and international sports, including football, baseball, UFC/MMA and more on your Andorid. The user interface is easy to use. 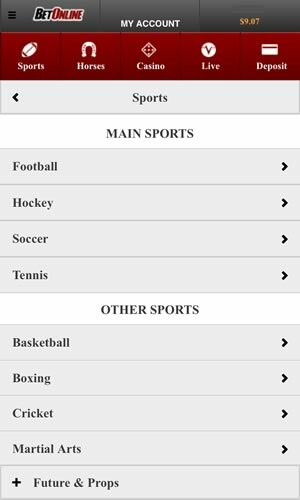 Just tap on the sport, choose a league and see what is offered. Select a bet, fill in the wager, and confirm. Betonline is one of the few traditional bookies that accept Bitcoin. This gives you the opportunity to move your money quickly and safely, with very low fees. All bitcoin payouts are processed within 48 hrs so you can have quick access to your winnings. When you first open their mobilesite from an Android or iOS device, you will have to login or register to continue. The sign-up process is quick and easy. Just fill in the required fields and tap the confirm button. You will have to verify your email before having access to your account. From some reason you can only access the racebook area after you've logged in. Betonline is instantly accessible from the Chrome or Safari browser of any smartphone or tablet. Since the app is browser based it will work from anywhere in the United States. If you want to have quicker access to the mobile sportsbook, you can set the Betonline page to appear as an icon on your home screen. As you could expect from a US-friendly bookmaker, Betonline covers all American sports and leagues. Besides NFL, NBA, NHL, MLB, MSL, they also offer college leagues. The markets include traditional spreads, but also lost of different prop bets. Other popular sports like European football (soccer), MMA, and boxing are also included. The minimum bet on Betonline is $1 and the maximum depends on the selected market. BetOnline tends to be used by many professional gamblers so limits tend to be quiet high. The odds offered are among the best for a US-friendly gambling operator and the juice is not high. ​Betonline has an interesting strategy when it comes to bonuses and promotions. Their main focus is on loyalty, so if you are looking for a long-term partner, you’ll get some great benefits. They offer 25% bonus on each of your deposits which is unique for the industry. The 6 times rollover requirement is a bit higher than normal, but high number of potential bonuses makes up for this. Android sports bettors are also well catered for with their $50 Mobile Betting Bonus. If your first wager from a mobile device loses, you are eligible for a reimbursement. Just write a mail to the support and you will get your whole stake (up to $50) back so you've got nothing to lose. They also offer a similar $50 free play when you use their In-Play betting service for the first time. ​The overall conclusion is that Betonline is one of the best bookies out there for American players. Their iOS and Android web-app provides a good platform for betting on the go. The great promotions add some extra value for long-term bettors and they offer some of the best odds in the business. Bitcoin as a cashier options makes it super quick and easy for US sports bettors to fund their accounts and collect their winnings.